If you voted, you can't complain. 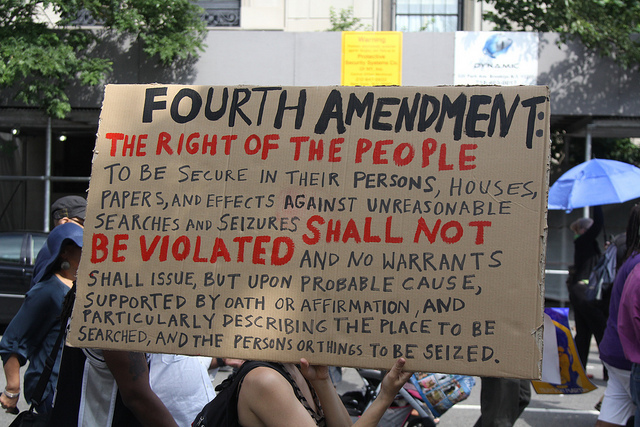 This window-dressing bill aside, both Democrats and Republicans were perfectly clear during the election (and last 11 years) that they would continue to gut the Fourth Amendment. If you voted for them, illegal surveillance is your fault, too. If you voted, you can't whine. Haven't you read the newspapers? Listened to Michael Moore, perchance? Don't you realize that we Democrats had to vote for Obama to protect him from racial discrimination? Do you realize how much the man has already suffered? Do you know that he had to settle for a second-rate degree from the so-called "Harvard Law School"? Just imagine what Obama might have accomplished if he had had a proper education, and wasn't exhausted by his menial work study job editing the Law Review. As a Democrat, I believe firmly in voting for tolerance. I believe that every child,* regardless of the color of their skin, should have an equal opportunity to become president, coddle Wall Street, sign anti-labor trade deals, make secretive corrupt deals with Big Pharma, pollute the Gulf, ignore global warming, trample the Bill of Rights, expand the empire and wage unilateral war across the globe. *Excluding US children Obama has already blown apart with drones, of course. An effective anti-surveillance bill won't pass and if it did Obama wouldn't sign it, and if he signed it he still wouldn't obey it. It's kind of a non-issue. We live in a Stasi-style state by popular demand. The Democrats no longer believe in a living Constitution, a reversal of their stance during the Warren Court. Now even liberals argue that the Constitution is antiquated. Except for the bit establishing an electoral process apparently. But, there are other issues harder to figure in today's news. If you asked "who is in charge of White House policy in the Middle East" today, the answer could only be Benjamin Netanyahu. It appears the Obama administration really didn't have any fall-back plans and Israel is taking advantage of the void by creating facts on the ground. This woudl would be a strange, and I suspect unpopular, lead-in to a wider war involving the US and Arab countries. I can't actually believe that Obama wanted Netanyahu to control the narrative and make the President look punked and subservient. Wasn't it only two weeks ago that Netanyahu was taunting Obama? Two: During the election, Democrats argued that Obama shouldn't present an economic plan for tactical reasons, since Romney hadn't either. (I thought that was dumb and anti-democratic reasoning, but it apparently worked.) But now we're two weeks out and there's still nothing coherent from the White House, not even a strategy about the supposed fiscal cliff. Very odd. I don't believe Obama is going to screw over workers and homeowners in favor of Wall Street as he (and Bush) did in 2008, but it seems increasingly likely the White House hasn't presented a strategy because Obama actually has no strategy. Obama simply skated through the election because the opposition didn't challenge him and no candidate represented non-elite interests. The economy is still a pressing issue, and don't think Americans agree with the President that the working middle class is dead and should be forgotten, or that education is a complete answer when the costs are prohibitive. The corporate media is all happy-talk about recovery and Obama's fresh start. But I don't think that narrative is sustainable if Democrats never actually do anything. Well, at least the Democrats have scuttled Leahy's warrantless surveillance bill. For now. I think what the Democrats were trying to do was gain more cover for surveillance (that probably already occurs) by having this anti-surveillance liberal in the House (which can't pass), and then a right-wing bill like Leahy's in the Senate. The strategy is to make Obama look "centrist" while actually eroding the Fourth (and the First). Obama probably would have had some self-righteous signing statement for Leahy's bill, similar to the one for the unconstitutional indefinite detention bill. Which he also signed. The White House has veered again to the far right, as it did in 2008, using liberals as a foil. I suspect the administration had a role in Israel's aggression as well. We're being manipulated.